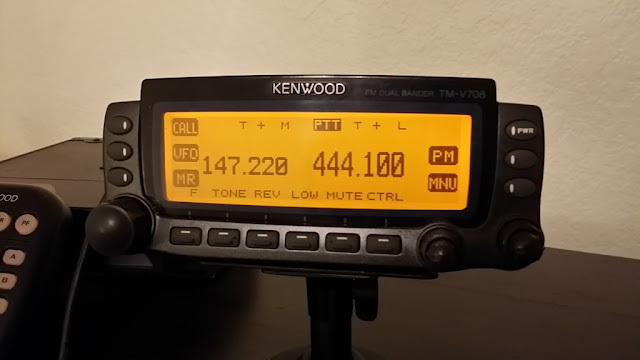 ➤ The advanced Kenwood TM-V708A dual bander provides world class communications. You will also enjoy wideband receive 118 MHz to 1.3 GHz (cellular blocked). The TM-V708A is similar to the TM-D700A except that it does not have. APRS firmware, TNC or computer hookups. It can receive two frequencies simultaneously (even on the same band!). 200 alphanumeric (8 char.) memories channels with a memory bank scan function is featured. The front panel is fully detachable. In addition to CTCSS and 1750 kHz tone burst, you also get DCS (104 codes) plus ten DTMF memories. The TM-V708A comes with: MC-58DM hand mic (with Up-Down and DTMF), DC power cable, fuse, front panel mounting bracket, main unit mounting bracket, microphone hanger and Instruction Manual. ↳ See the April 2006 issue of QST for a complete review of the TM-V708A (page 72).